This makes me feel much better. I see so many people who have received mislabeled Betta and am torn between educating and letting well enough alone. But I finally decided if a forum's purpose is to educate not only the OP but anyone else reading I might as well put on the flame suit. For instance, I see so many who call metallic Betta "dragons;" this is especially true if the Betta is has black fins. The difference is a Dragon *must not* have a metallic sheen; it must be opaque and is usually pure white like your girl's scales. In future, if you are identifying and the scales are not opaque you know the seller has mislabeled a Betta. Now you can differentiate between the two. So there's another little tidbit for you. I think you are in for a fun time as you see what you produce from this pairing as they are very nice specimens. You might get some really interesting colors. Can't wait to see them. I started letting male and female see each other over the weekend. Female does not seem to be impressed by the male but she will flare at her reflection. Male, when he sees female, goes nuts, not only does he flare at her, he swims all around the tank like he does not know what to do with himself. Not a good start of a relationship is it? Anyways, male is gaining weight steadily and both seem happy in their new homes. There is reflection for the female betta tank. That is what's causing her to flare at the other side. Try covering the other side with a light color paper as darker background can cause a reflection. Last edited by GazHMPK; 05-29-2018 at 08:57 AM. That was a good advice, divider between them was a black plastic =) swapped it for a white printing paper and she is not spending so much time on this side anymore. Female is getting round from the eggs but now I'm worried, since I have to wait at least three more weeks for the right conditions, is this not to long? Will she keep the eggs for a this long or just drop them? It would be really awesome if someone could confirm my girl will not drop her eggs before time is right. Male and female are both in the breeding tub, female in her glass protection. They both seem very interested in each other. 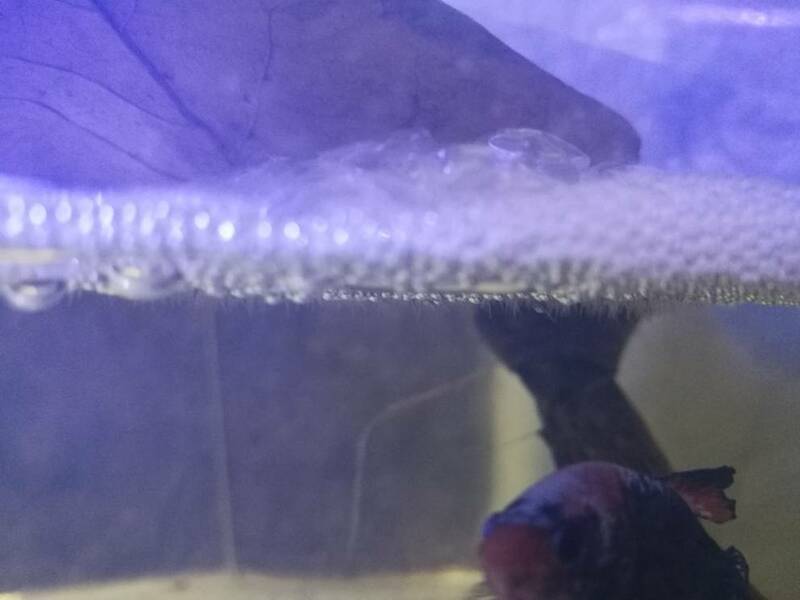 Male has already build a nice bubble nest. I'm going to release he tomorrow and we'll see if we get a successful spawn or a complete fiasco. Tried to take photos but turned out dark and blurry. I did not want to disturb them too much. Made this video of my fish. It is a really bad video (no light and through plastic) but you can see male flaring at female in the first half, second half is just him building the nest. I made this video just to show the ones who are curious what the males form is like. Unfortunately you wont be able to see just how vibrant his colours are. I released female at 8:15 am this morning and they went at it straight away. I was surprised by how gentle they were with each other. There vere many successful and failed wraps but by 1pm they were done so, I removed the female before male got any ideas. There is not one scale missing, not a fin thorn. They really are a good fit. Not too many but it's what I expected for their first try especially since the first few wraps I saw male diving for eggs but not spitting them into the nest. Fingers crossed for the babies. They are in a room temp of 80f. All the live food ready and I can stop worrying about the parents for a moment. I could use at least one baby though, so that I know if there's a reason to start again next month or maybe get another pair now. Just noticed first fry trying to wiggle its way out of the egg!! Approximately 30hours after spawning is a LOT earlier than I expected. Since I have no heater and night temperature is a bit lower (day 25-28, night 20-22) I thought hatching will take longer than usual. Even if this spawn die, at least I know none of my bettas are infertile but I may need to use a heater with the next spawn. All depends on how this first batch does. Temp is to drop for a week on the 6th than go back up again. Male looks tired and bored, thank heaven's he will not have to be in there much longer. I'm testing my BBS to see if it's a good batch, if not, there's still time to buy more.